Even though I only overlapped with Hank Riggs for one year at Mudd, he made a lasting impression on me. He always went out of his way to get to know the students on a personal level. It was an honor to know him. I met Hank Riggs when he called me to ask if would be interested in helping him start a new kind of educational institution in Claremont. He painted an exciting new picture that fit well with my views and inclinations about how to bring the benefits of the life sciences to society, and we met to discuss the establishment of what became KGI, the Keck Graduate Institute. I quickly realized what an extraordinary person Hank was, imaginative, determined, completely honest and passionate about the possibilities, intensely interested in the future, and the leaders of the future. I came to value both his judgment, his deep integrity, and his dedication to education and to the students he affected. He became a dear friend as we worked hard to forge his initial vision into reality, and I realized how wonderful he must have been in his role as president of Harvey Mudd for the decade before I knew him. Hank Riggs was always aware of the effect of what he did on the people involved, and especially the students he touched. I recall clearly those moments when he would stop to ask, will this really be best for the students? Can we do something better? The students he touched are his true legacy, but he left his mark on many. I will remember him warmly as a friend and colleague of extraordinary value. Many will miss him. I certainly will. In addition to being a great president to HMC in the usual ways on thinks of, I wanted to share this: When I was new to HMC as a freshman, we had quite an earthquake with the epicenter very near HMC. I recall feeling quite uneasy, since this was my first earthquake and I was so newly launched from home/childhood. I also recall Pres. and Mrs. Riggs walking around campus talking to students who had gathered outside on lawns to reassure us. Their caring presence really helped. Thank you for leading HMC so well and taking such good care of us students! My sincere condolences to President Riggs’ family. He was the main reason for my 25 years’ involvement with HMC. My memory of President Riggs was his calm demeanor, his visions for HMC and his ever present bow-tie. Until he came along, my participations with HMC were limited to hiring of summer interns and funding of clinics. Through him, I joined the President’s Advisory Committee and my association with HMC flourished. He was a visionary, always expected nothing but the best of HMC’s standing among institutions of higher learning and in society. He took what the legendary President Platt left us and created an even better place for HMC students. The great foundation he left for his successors enabled them to continue the grand traditions and to build one of the best institutions not just in the US but the world. I was sadden when he left to start Keck but happy that he remained within Claremont. I admired his pioneering spirit, willingness to be a trail blazer and left a great legacy at all the institutions he touched. His passing is a great loss to us all. Professor Riggs was one of my favorite professors at Stanford – not sure how he made accounting so interesting! I remember the last course lecture – on how to tie a bowtie! I was always amazed by his energy, intellignence and success in his various endeavours. I particularly liked his NYT article on the cost (price) of a college education – classic Hank insight. We will all miss him- especially at the annual Witte-Riggs Holiday cookie and soup party. The world and higher education is in a much better place because of Hank Riggs. Hank was my late husband, Hal Leavitt’s, colleague at Stanford Business School before he came to Claremont to lead HMC. We were so happy to have the opportunity to see Hank and Gayle during their Claremont years and missed them when they moved back to Palo Alto. Hank was a wonderful, warm, brilliant, humorous, and kind friend and colleague. He is irreplaceable. My deepest sympathies to Gayle and the family. I never would have served on the HMC Board if it hadn’t have been for Hank. He called me out of the clear blue and convinced me it was my duty. He was a visionary and all around great guy to work with. I’ll really miss him. His warmth and friendliness melted any fears I had, and I was so happy that he could help. I feel incredibly fortunate to have had the opportunity, as a young person in my first “professional” job in fundraising at HMC, to work closely with someone of Hank Riggs’ calibre. His intellectual capacity and curiosity, his drive to succeed, and his wonderful sense of humor never seemed to fail him. We shared many triumphs together, including the successful winning of a multi-million dollars grant to build the F. W. Olin building for the college’s then-new biology program. I know he will be deeply missed by not only his personal friends and family, but by all those whose lives he touched while at HMC. Thank you for your generous spirit and inspiration. You will be missed. President Riggs helped to advice me with the launch of my first company, and gave very honest feedback on my initial business plan. Before that, he was very supportive of my somewhat naive efforts my senior year to create a project fun in honor of some then current faculty to help support the HMC Robotics Design team. However, fondest memories are of President Riggs’ huge smile, colorful bow ties, and cheerful support for us students. Of course, I’ll always remember his infamous joke, copied below. He made a huge impact on all of us! Hank and Gayle Riggs arrived in August 1988 (8/8/88 to be precise) to begin their duties as the third couple to preside over Harvey Mudd College. It was an opportune time, as the faculty had just approved an ambitious, but expensive, long-range plan calling for significant improvements all across the campus. Building upon that plan, Hank led the college through some remarkable changes in curriculum and facilities that are documented elsewhere. He played the lead role in all of these accomplishments, recognizing both the opportunities and the problem areas in the College and addressing all of the issues eloquently, both in speeches and in carefully crafted written analyses, starting with with his famous ‘Screed’ in 1988. He was a strong advocate for change (even when it drew criticism), and he personally directed the successful campaign that paid for the many improvements to the College. 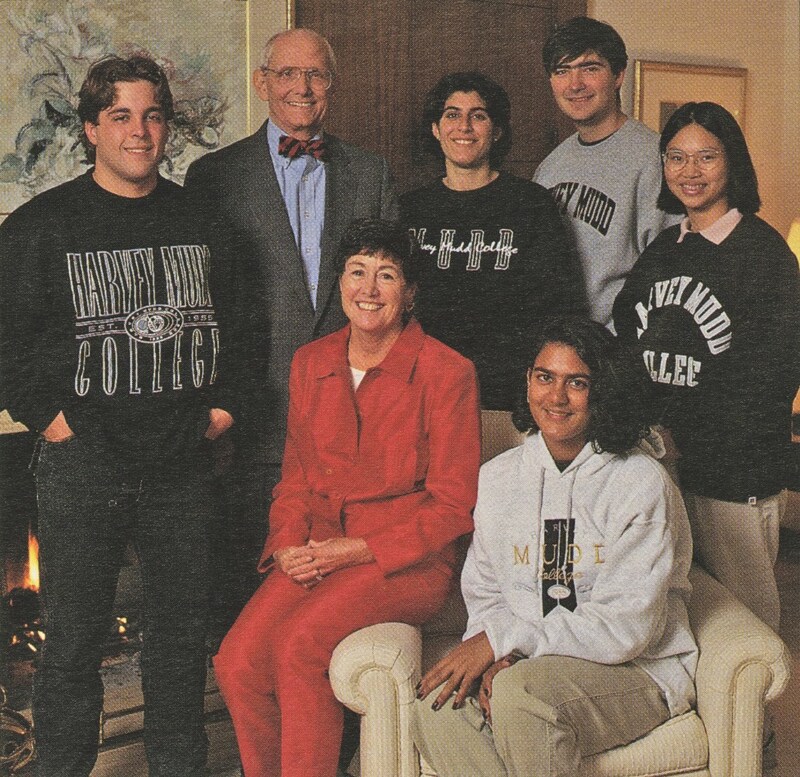 By virtually any objective standard, HMC is now a much stronger college than it was in 1988, and for that we can all be grateful to Hank and Gayle Riggs.